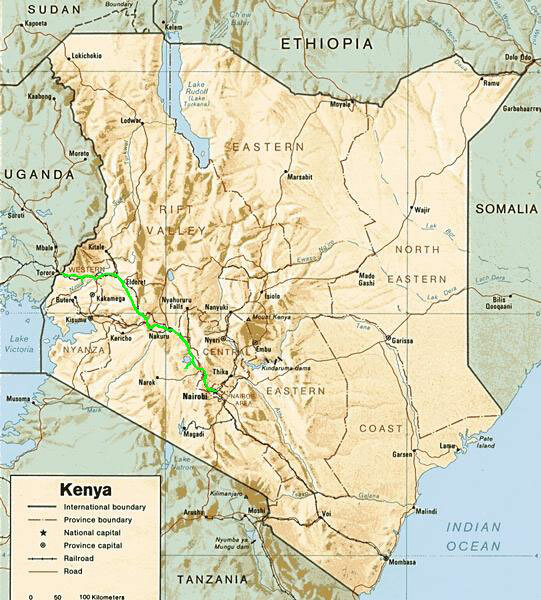 487 km of cycling - as part of a bicycle world trip - from the capital Nairobi to Hell´s Gate National Park, northwestwards crossing the equator to Eldoret and further west to the border with Uganda. Do you like Cycling Kenya? Once again I found myself lucky when running into a Kenyan at the check-in at New Delhi Airport, as I got some decent first-hand information while chatting with him. I also spent the six hours of waiting time in Bombay with him and asked him fairly everything imaginable. Another six hours later I arrived in Nairobi, in Kenya, in Africa! It took just a couple of minutes while looking in friendly faces with brightly shining, white teeth everywhere. A little talk and some laugh together with them and all my doubts were gone. Three days later Hugo arrived and another three days later we got finally started. We pitched our tents at Hell's Gate National Park and in the evening I went with a Kenyan guy in his car to the nearby supermarket. On the way back suddenly something mighty stepped out of the bush and stopped right next to our car. Just about one metre away it watched us from above: a really incredibly huge giraffe! After a while it moved across the road together with a smaller female and disappeared in the dusk. I sat with a wide grin in the car, cause now I felt that I actually had been arrived in Africa! Together with Karo and Kerstin from Austria we walked through Hell's Gate National Park, getting sights of giraffes, zebras, antelopes, gazelles and monkeys. We walked and climbed stunning Ol Njorowa Gorge with its hot springs and its impressive sandstone walls, sculpted by water for centuries. Next day finally the for this time of the year rather unusual clouds disappeared and we cycled westwards to Eldoret under a blue sky up and down on mostly terribly bumpy pothole roads, painfully often just in walking pace. As Africa wasn't particularly famous for its rich choice of real and good cheese, we gave the local cheese factory a visit and stocked up on huge amounts of surprisingly tasty first class cheese. 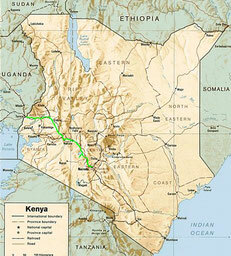 Two weeks after the arrival in Nairobi we crossed the border to Uganda at the small and dusty border town Malaba. The welcome to Africa in Kenya had been just a short glimpse of this country, limited to its western parts, but it had been far more relaxed and safe than expected. Actually I had planned to meet up here with Terry from the US. We had cycled together at the beginning of this trip almost two years ago in Cambodia, but very unfortunately we didn't get it managed, as his remaining time in Tanzania was limited, and as for us it would take a while before reaching Tanzania. Uganda was waiting!